Soccer in College was started in 2001 as a website to help athletes get more involved in the college recruiting process and help them connect with college coaches. After going through the process with his four children, he learned how important it was for athletes and their parents to be active in the search. There are THOUSANDS of athletes around the world looking to continue playing soccer in college which makes it nearly impossible for a college coach to find you: UNLESS THEY KNOW YOU'RE INTERESTED! This fact and the need for a system which makes the process easier on athletes and college coaches is the basis for Soccer in College. Now, athletes have a website where they can build a profile, search through our database of colleges, and contact the coaches for the programs they are interested in. We teach our "College Bound Athletes" what they need to do to be effective and also give them reminders along the way to make sure they stay active. This service is still the major focus behind all development of our site. SincSports.com website that highlights many of the features which make our system the best on the market! Another important feature we have developed is our ranking system. Our rankings are completely objective and are soley based on the games in our system. We developed an algorithm that runs through all the games played within the past year and rates teams based on their results. The greatest strength of our ranking system and what makes us different than other systems out there is that we let the results speak for themselves. We do not calculate our rankings based on the players on your team, the organization you are a part of, or by how good an "expert" says you are. Because of this model, each person using our system is very important to help make our rankings more accurate. We encourage our users to enter in as many games as they can to help improve the ranking in their state, region, and across the nation. 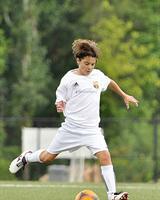 John spent over a decade in Club soccer with his four children that were immersed in the game. While searching for the best programs for them, he founded the Eclipse Soccer Club in Illinois, which has gone on to be one of the top clubs in the country; now holding numerous national titles. When it came time for his children to go to college they each had their own needs and goals. Two of them went on to play and lead in Division III programs and two took leadership roles in Division I programs. As a computer consultant and business owner with a background in finance and programming, he still found it difficult to navigate the recruiting process and knew their must be a better way. John developed the SportsInCollege sites which have grown into a proven interactive system that have already helped thousands of athletes without taking advantage of students or parents that are just seeking a path through the recruiting gauntlet. Janet has been with Sports In College since it's conception. She has many years of project management experience in the IT industry as well as with Telecommunications which includes customer service expertise. Her experience with the project management and customer service has been instrumental in the development and continuing growth of the company. Jonathan has been working with Sports in College since 2002. While attending college at DePaul University on an athletic scholarship, he received his B.S. in Computer Science and later went back to DePaul to get his M.S. in Software Engineering. He combines his experience as a collegiate athlete with his web development knowledge to help build many of the tools available to athletes and college coaches on Sports in College. Mark comes to Sports in College with 4 years as a collegiate athlete, 3 years as an Associate Director of Undergraduate Admissions, and 6 years of Corporate Recruiting / Human Resources experience. This combination allows him to have an invaluable understanding from both the student athlete and university perspective. Mark resides in the western Chicago suburbs with his wife and three children. Sabrina Connelly began working for Sports in College in 2003 as Co-President of Basketball in College. Her background includes being captain of the women's soccer team at Benedictine University and being ranked nationally among NCAA Division III athletes two years in a row. She has a Bachelor's degree in psychology and a Master's degree in social work. Sabrina resides in the Chicagoland area with her family. Jennifer comes to Sports in College with 4 years as a Division I collegiate athlete who played soccer on a scholarship at DePaul University. After graduating, she went on to teach in an elementary school in the northwest suburbs while also training soccer for an elite club in Arlington Heights. Jennifer Staniak joined Sports in College in 2003 as co-President of Basketball in College. Jennifer attended the University of Wisconsin - Green Bay on a soccer scholarship and lead the team as a four year starter and two-year captain. She brings marketing, education, and coaching experience to help athletes find a path to their sports dreams. Jennifer enjoys exercising, cooking, outdoors, and time with her family. She currently resides in the Chicago suburbs. Originally a Milwaukee native, Ryan brings his design expertise to Sports in College. From visual design to usability and marketing, Ryan's responsibility is to ensure your experience at Sports in College is a good one...every step of the way. Ryan lives in the Chicago Suburbs with his family.